Luck enchants wealth and wealth leads to money. So, introduce luck to your fortune that will ever increase and also retain its value. We help you with this by bringing forth an exclusive range of Lucky Coins Incense Sticks that entice luck with its fragrance and smoke. Slowly it burns, and increases your fortune. Our Incense Stick is made using high grade ingredients like biotic and combustible materials such as flowers, wood, and herbs that found utmost importance in Hindu customs. The aroma will captivates your senses and leave you mesmerized. 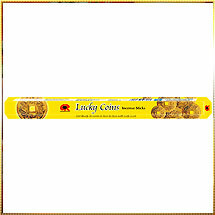 Moreover, we offer you Lucky Coins Incense Stick at market leading prices.